In this article, we highlight the 20 best online schools for counseling in 2017. Colleges and universities offer accredited online counseling programs for individuals interested in working in the fields of applied psychology or counseling. Online options for undergraduate degrees are offered at some of the nation’s top-ranked schools. The online programs are often similar to the ones found on-campus. In fact, many of the online programs mirror the content and curriculum delivered in the on-campus classes. Percentage of applicants admitted, overall graduation rates, undergraduate tuition/fees, and student-to-faculty ratios. Our data was collected from the most recent information published by the National Center for Education Statistics (NCES) College Navigator. The information gathered was used to create our list of 20 best online schools for counseling. In the event of a tie, the school with the lowest tuition was awarded a higher ranking. The methodology we used is listed below. Southern New Hampshire University is one of our best online schools for counseling and is ranked as the #1 most innovative school. Southern New Hampshire University earns a spot on our list of online schools for counseling primarily because of its high graduation rate. Also, the school ranks with major publications like U.S. News and World Report. In fact, the most recent edition of Best Colleges ranks the institution 101st for best regional universities in the North and the #1 most innovative school. For individuals interested in a counseling major, Southern New Hampshire University offers a bachelor’s in psychology program with a mental health concentration that can be completed entirely online. All classes are delivered online and taught by the same university professors who teach on campus. Courses include assessment and testing, counseling process and techniques, introduction to psychology, scientific investigations, and statistics for psychology. The high graduation rate puts Regent University on our list of top online schools for counseling. One of the top online counseling schools on our list is Regent University. The institution offers reasonable undergraduate tuition and a relatively high graduation rate. Regent is also ranked as a top national university by major publications like U.S. News and World Report. In fact, the most recent edition of Best Colleges ranks the school as having the 17th best online bachelor’s programs out of more than 1,200 surveyed programs in the country. The school offers an online bachelor’s in psychology program designed for those interested in counseling, human services, ministry, or training. The 120-credit program offers courses entirely online that are taught by university professors with years of counseling and ministry experience. Online courses include abnormal psychology, data analysis, multicultural psychology, social psychology, and research methods. One of the most affordable online schools for counseling on our list is Bellevue University. Bellevue University’s extremely affordable undergraduate tuition and fees earn it a spot on our list of top online counseling schools. Students interested in counseling and psychology can major in professional psychology at Bellevue. The program offers three areas of specialization so that students can tailor their degrees to suit personal interests or career goals. Areas of emphasis include foundations of counseling, industrial and organizational psychology, and lifespan transitions. All classes are delivered online and include contemporary psychology, mental health practices, and premises of mental health. Bellevue is ranked by major publications like U.S. News and World Report. In fact, the online bachelor’s programs rank #72 out of more than 1,200 surveyed programs. Low student-to-faculty ratio! Franklin University is a top online school for counseling and applied psychology. Franklin University’s affordable undergraduate tuition and low student-to-faculty ratio earn it a spot on our list of the best online schools for counseling. The applied psychology major is designed to equip students with the knowledge and experience needed to move into a psychology-related career. All courses are delivered online and include applied psychology theory and practice, applied research methods, community mental health, public psychology, and the psychology of personal development. Successful completion of the program earns a bachelor’s in applied psychology. Franklin is ranked by major publications like U.S. News and World Report. In fact, the most recent edition of Best Colleges lists the school as having the 106th best online bachelor’s programs in the nation. Columbia College earns a top spot on our list of online counseling schools. Columbia College’s moderately high graduation rate and affordable undergraduate tuition earns it a spot on our list of best counseling schools online. Also, the school is ranked by U.S. News and World Report as having the 106th best online bachelor’s programs. Columbia’s ranking is tied with Franklin University’s online bachelor’s programs. Students can major in psychology and select from two areas of specialization: experimental and practical. The practical specialization includes clinical and school counseling. All classes are delivered online and include experimental psychology, group process, integrative psychology, introduction to clinical and counseling psychology, personality theory, and social psychology. All courses are taught by experienced professors who routinely instruct on the Columbia campus. One of the best online counseling schools on our list is Utah State University! Affordable undergraduate tuition and fees combined with a higher than average graduation rate earn Utah State University a spot on our list of best counseling schools online. Individuals interested in an undergraduate counseling degree can earn a bachelor’s in family life studies from Utah State entirely online. The program is designed for those interested in working in crisis centers, drug treatment centers, social services agencies, or youth and adult residential care centers. All courses are delivered online and taught by the same professors who routinely teach at the Logan campus. Courses may include addictions and the family, families and cultural diversity, human sexuality, methods for family life educators, and social and family gerontology. Utah State is ranked by major publications like Forbes magazine and U.S. News and World Report. In fact, the most recent edition of Best Colleges ranks the school’s online bachelor’s programs #20 out of more than 1,200 surveyed programs. A high graduation rate earns Florida Tech a place on our list of best online schools for counseling. Florida Institute of Technology earns a spot on our list of best counseling schools online due to the low student-to-faculty ratio and high graduation rate. The school is also ranked a best national university by major publications like U.S. News and World Report. In fact, the most recent edition of Best Colleges ranks the institution as having the 92nd best online bachelor’s programs in the country. Students may earn a bachelor’s in applied psychology by taking classes that are delivered entirely online. Four areas of concentration are also available so that students may tailor their degree to better suit their career goals. These specializations include child advocacy, clinical psychology, forensic psychology, and organizational psychology. Azusa Pacific University integrates Christian worldview and is one of the top online schools for counseling on our list. Azusa Pacific University’s low student-to-faculty ratio and high graduation rate earn it a spot on our list of online schools for counseling. Students interested in a counseling major may earn a bachelor’s in applied psychology with an integration of Christian worldview. The program is offered entirely online and with 11 areas of emphasis, including applied pastoral counseling, child and adolescent psychology, clinical psychology, educational psychology, and human services. Online coursework includes integration of psychology and Christianity, interviewing and counseling techniques, professional and ethical issues in psychology, and psychology of emotions. Azusa is ranked as a best national university by major publications like U.S. News and World Report and is one of our top picks for counseling schools online. University of Indianapolis’s low student-to-faculty ratio earns it a top spot on our list of best online counseling schools. The University of Indianapolis is one of our best online counseling schools due to the low student-to-faculty ratio and high graduation rate. The school offers an online bachelor’s in applied psychology for individuals interested in areas of human services and counseling. In fact, a 12-credit concentration in clinical and counseling studies is available so that students may tailor their degree to suit personal interests and career goals. All courses are delivered online and include abnormal psychology, application of psychology in clinical and counseling settings, foundational skills of the helping professionals, and personal and sociocultural factors. The university is ranked by U.S. News and World Report as a best regional university in the Midwest. High grad rate and low student-to-faculty ratio. Lesley University is a top choice for online schools for counseling. Lesley University earns a spot on our list of best counseling schools online because of its high graduation rate and low student-to-faculty ratio. Students can earn a bachelor’s in psychology entirely online without disrupting personal responsibilities like daytime employment. All classes are delivered online and include abnormal psychology, elements of statistics in psychology, lifespan development, psychology of learning and behavior change, and social psychology. The program is designed as a foundation for those interested in pursuing counseling and psychology careers. Lesley University is ranked by major publications like U.S. News and World Report as the 197th best national university in the country. Earn a degree in 22 months! Indiana Wesleyan University earns a top spot on our list of online schools for counseling. Indiana Wesleyan University earns a spot on our list of the 20 best online schools for counseling due to the low student-to-faculty ratio and high graduation rate. Students interested in a bachelor’s in addictions counseling with a Christian perspective can complete the program entirely online at Indiana Wesleyan. All classes are delivered online and the program is designed to be completed in just 22 months. Online courses include addictions counseling skills, addictions psychology, counseling addicted and dysfunctional family systems, developmental psychology, and theory and practice of group counseling. Indiana Wesleyan is one of our top online counseling schools and is ranked by U.S. News and World Report as the 27th best regional university in the Midwest. Liberty is a Christian university that earns a top spot on our list of best online schools for counseling. Liberty University earns a spot on our list of best online counseling schools due to a variety of reasons. The school is highly selective with admissions, offers a low student-to-faculty ratio, and has a relatively high graduation rate. Liberty is also ranked by major publications like U.S. News and World Report as a best national university, and its online bachelor’s programs rank #100 out of more than 1,200 surveyed. Liberty offers an online bachelor’s in Christian counseling with classes delivered entirely via distance education. The degree is designed to prepare students for non-clinical roles in the field of counseling and psychology. Classes are taught by experienced professors and include Christian counseling for children, Christian counseling for marriage and family, issues in counseling, issues in human sexuality, and psychology of personality. UMass offers a high graduation rate and affordable tuition. It is one of our top picks for online schools for counseling. The University of Massachusetts is listed among our top online counseling schools due to its affordable tuition, high graduation rate, and moderately low student-to-faculty ratio. UMass offers an online bachelor’s in psychology program that is designed to prepare students with the foundational skills needed for careers in abuse prevention and treatment, counseling, and human services. All courses are delivered online and include abnormal psychology, family violence, leadership and organizational behavior, social class inequality, and substance abuse. Courses are taught by the same instructors who teach on campus. UMass is ranked by major publications like U.S. News and World Report as the 74th best national university in the country. Also, the school’s online bachelor’s programs rank #63 out of more than 1,200 programs surveyed. Penn State University’s low student-to-faculty ratio and affordable tuition helps earn it a top spot on our list of online schools for counseling. A low student-to-faculty ratio and affordable undergraduate tuition earn Pennsylvania State University a top spot on our list of online counseling schools. Students interested in counseling and psychology can earn a bachelor’s degree in psychology entirely online and without attending traditional courses. All classes are taught by university professors who routinely teach on campus. Courses include basic research methods in psychology, introductory psychology, psychology as a science and profession, and senior seminar in psychology. A three-credit internship is optional and students may complete their work in their preferred geographic location. Penn State is ranked by major publications like U.S. News and World Report. In fact, the most recent edition of Best Colleges ranks the school as the 50th best national university and the 14th top public school. Affordability! Central Michigan University is one of our best online schools for counseling. Central Michigan University is a nationally ranked institution that earns a top spot on our list of the best online counseling schools due to its affordable undergraduate tuition and high graduation rate. The school is ranked by U.S. News and World Report as the 220th best national university and 110th top public school. Also, the online bachelor’s programs are ranked #43 out of more than 1,200 surveyed programs in the most recent edition of Best Colleges. Students may major in psychology and take counseling classes that explore mental health and human development. All classes are delivered online, and successful completion earns a bachelor’s in psychology. Central Michigan University is one of our top online counseling schools for 2017. Oregon State University offers one of the highest-ranked online bachelor’s programs in the country and is a top online school for counseling and psychology. Oregon State University is one of our best online counseling schools primarily due to the low undergraduate tuition and fees for in-state students and the high graduation rate. OSU is a top-ranked institution by major publications like U.S. News and World Report. In fact, the school’s online bachelor’s programs rank #7 out of more than 1,200 surveyed programs. OSU offers an online bachelor’s in psychology for those interested in careers as counselors or other psychology roles. Classes are developed and taught by renowned faculty who routinely teach on the main campus. Course topics include abnormal psychology, behavior modification, brain and behavior, human lifespan development, and social psychology. OIT is one of the most affordable online schools for counseling on our list. Oregon Institute of Technology (OIT) earns a top spot on our list of best online counseling schools due to the highly affordable undergraduate tuition, moderately high graduation rate, and relatively low student-to-faculty ratio. OIT offers an online bachelor’s in applied psychology program that is designed to equip students with skills in specific areas of counseling and psychology. All courses are delivered online and include abnormal psychology, basic counseling techniques, cognitive psychology, human growth and development, psychological research methods, and social psychology. Oregon Institute of Technology is ranked by major publications like U.S. News and World Report as the 3rd best regional college in the West, the #1 top online public school, and the 2nd best college for veterans. Also, the school’s online bachelor’s programs, including psychology, are ranked #199 out of more than 1,200 surveyed programs in the most recent edition of Best Colleges. Belhaven University’s low student-to-faculty ratio helps earn it a top spot on our list of best online schools for counseling and psych. Belhaven University’s low student-to-faculty ratio and high selectivity for admissions earn it a top spot on our list of online schools for counseling. Belhaven is a regionally ranked institution. In fact, major publications like U.S. News and World Report rank the school as the 52nd best regional university in the South and the 20th best value school. Students interested in counseling can major in applied psychology and earn a bachelor’s degree entirely online. The school’s online bachelor’s programs rank #212 out of more than 1,200 programs surveyed in the most recent edition of Best Colleges. The online bachelor’s in applied psychology offers online courses taught by the same university professors who teach on campus. These courses include counseling theory and techniques, introduction to psychological research, social psychology, and theories of personality. 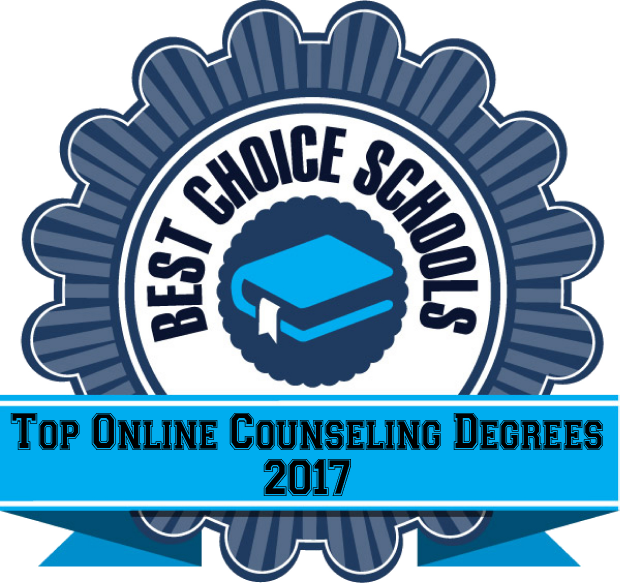 Belhaven is among our top 3 best online counseling schools. Toccoa Falls College’s selective admissions earns it a spot on our list of top online schools for counseling. Toccoa Falls College offers one of the best online counseling schools on our list due to its low student-to-faculty ratio and its high admissions selectivity. The school also offers reasonable tuition costs for undergraduate students. Individuals interested in a counseling degree can major in counseling psychology at Toccoa Falls. The program is delivered entirely online and includes courses like Christ-centered counseling, counseling skills, crisis and trauma therapy, development psychology, personality theories, and premarital and marital counseling. A counseling internship or psychology research project is also required. Toccoa Falls earns a top position on our list of the top online counseling schools. Old Dominion University is our #1 pick for best online schools for counseling. Old Dominion University is our top pick for best online counseling schools due to the highly affordable undergraduate tuition, high graduation rate, and moderately low student-to-faculty ratio. Old Dominion is a nationally ranked institution by major publications like U.S. News and World Report. Students interested in counseling and psychology may earn a bachelor’s in psychology entirely online. This online program is ranked by U.S. News as the 49th best online bachelor’s program in the nation. All courses are delivered online and taught by ODU professors with years of experience in research and instruction. Courses include developmental psychology, quantitative methods, research methods, and social psychology. Old Dominion is our #1 pick for the best online schools for counseling and psychology. This article highlighted the 20 best online schools for counseling in 2017.